Michael Warren is a sculptor of the essential: he uses the least number of articulations to get maximum efficacy of form. Rather than on formal appearance, his work depends on the aggregation of the surrounding void. Trade Winds may be seen as a tribute paid to Portugal and its extraordinary maritime history. As early as the 15th century, the Portuguese learned the importance of the trade winds in navigation both in the north and south of the Atlantic Ocean. These winds blow predominantly from the northeast in the Northern Hemisphere and from the southwest in the Southern Hemisphere, enabling the establishment of trade routes across the Atlantic Ocean, as well as the expansion of European empires into the Americas. During this period of great expansion, the Portuguese developed the caravel, a fast, highly manoeuvrable ship with the capacity for sailing windward, which could also be propelled by oars. There were two types of caravels — the lateen caravel and the round caravel. The latter was a later evolution in design, more suitable for long journeys and steady winds. Based on the 15th-century Portuguese caravels, Michael Warren built Trade Winds, a sequence of three 3-metre-high vertical metal elements. 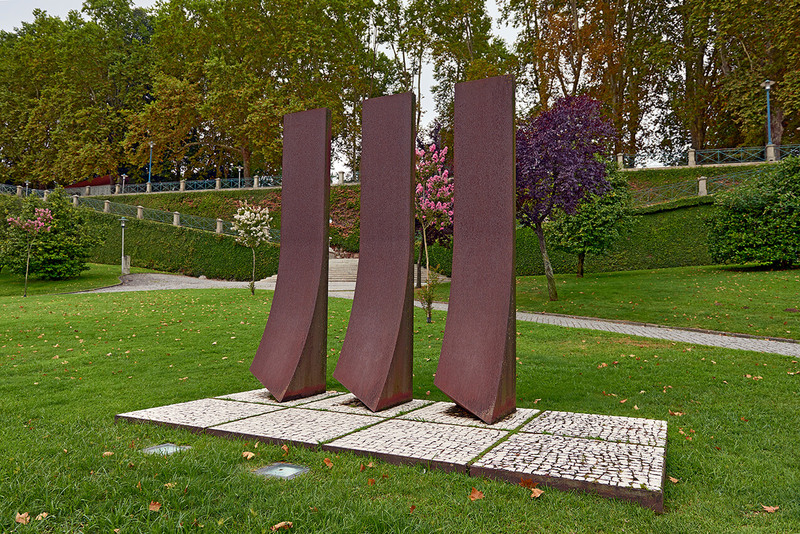 Their concave shapes, together with their sharp edges at ground level, remind the viewer of the force of the wind on the sails of Portuguese vessels during the Age of Discovery. In general, Michael Warren’s oeuvre mostly consists of site-specific, large- and medium-scale sculptures using materials such as wood, stone, metal or concrete, left as close as possible to their natural states. Though massive, his sculptures are marked by fineness of structure, usually in tune with the underlying history of each site, which the artist explores as an essential element in the design of the piece. Warren intends his public sculptures to make an impact not only on the surrounding landscape but on all those who look at them.